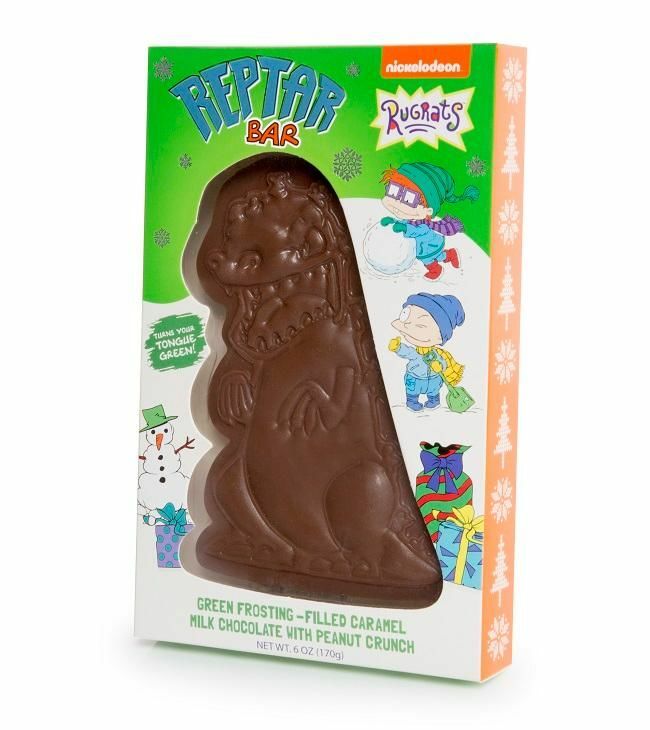 Albany, NY, November 1, 2018 -- Through a partnership with Nickelodeon, FYE will once again delight fans with a new spin on last year’s very successful Reptar chocolate bar, inspired by the hit Nick ‘90s animated series Rugrats. Hold on to your diapies babies, Reptar is back and better than ever! Trans World Entertainment is a leader in entertainment retail and operates retail stores in the United States, the District of Columbia and Puerto Rico, primarily under the FYE brand and on the web at www.FYE.com. SOURCE Trans World Entertainment Corp. Trim your tree this holiday with a Reptar Christmas Tree ornament (image above)! 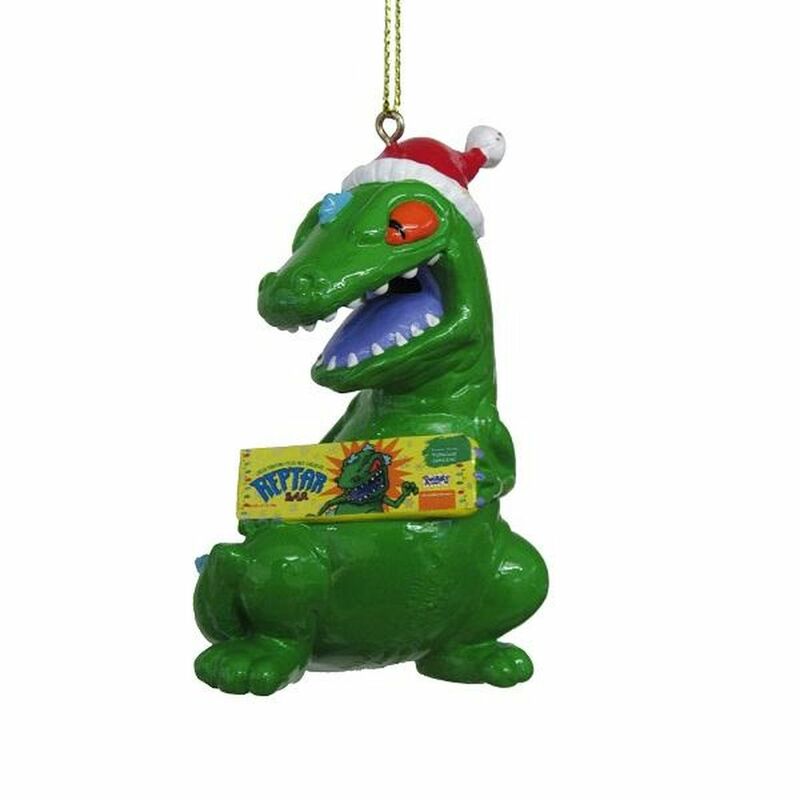 Besides a T.Rex shaped chocolate bar and Reptar Christmas Tree ornament, there are many more products that will keep the '90s alive. You'll find Reptar shirts to rock to your next cycling class and a Chuckie Rugrats keychain that will ensure you never lose track of your house or car keys ever again. While '90s Nick Kids might miss certain details of their childhood, like watching a Rugrats marathon without being aware that there would ever be a worry about final exams or big meetings in their future, there are perks to being an adult. For example, getting to make the decision that stocking up on multiple candy bars is a very good idea. 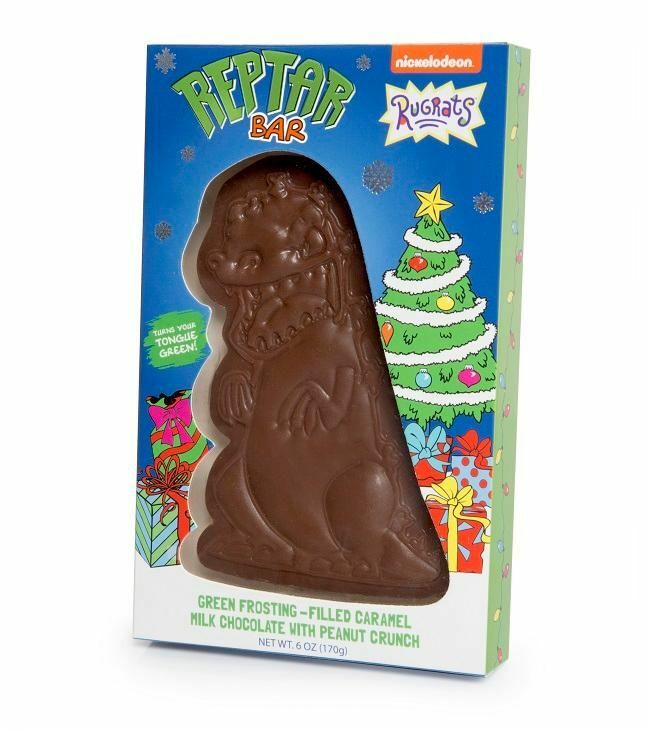 Around this time last year, the pop culture fanatics at FYE partnered with Nickelodeon to make the dreams of Rugrats fans come true by releasing a real life Reptar chocolate bar filled with green frosting. It was a fun dose of nostalgia for the fan favorite Nicktoon of children of the ’90s, but it sounds like they may have heard the cries of some fans who were hoping for a more authentic recreation of the cartoon treat. FYE is releasing a new and improved Reptar bar that is actually in the shape of the mighty Reptar, the dinosaur that Tommy Pickles and his friends were so obsessed with on Rugrats. And the good news is that the candy concoction is still filled with frosting that turns your tongue green. Find out how and when to get it below! The taste of the Reptar bar may actually be improved too. While the initial Reptar bars were milk chocolate with frosting inside, you’ll notice that these new Reptar bars are actually caramel milk chocolate with peanut crunch. Now the only downside is that the Reptar bar doesn’t come inside of a wrapper that looks like Reptar himself, but we’ll take what we can get. They've also created a "Reptar on Ice" version of the original bar that features blue frosting inside, which will turn your tongue ice blue! Need to taste the new and improved Reptar bars at all costs? 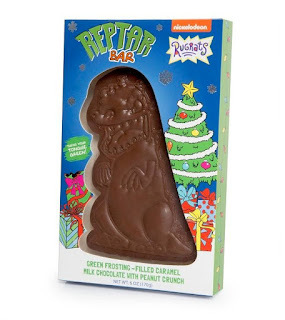 That's good, because pre-ordering the Reptar Bar Deluxe (available in two holiday-themed packaging options) will set you back $17.99 each, and are exclusive to FYE is the only place you can get it. However, they are “deluxe” candy bars, and appear to be much bigger than your average candy bar. A five pack of Reptar on Ice Bars will cost you $19.99, with individual bars being made available in stores. 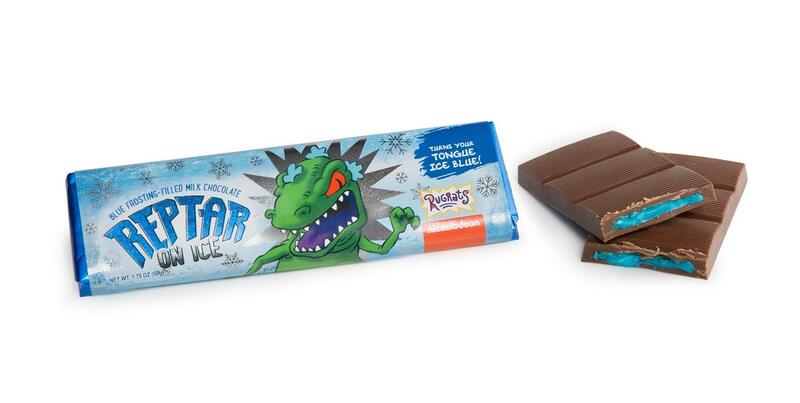 The Reptar Bar Deluxe is set to start shipping and appearing in stores on October 26th. The Reptar on Ice edition arrives on November 8th, just in time for the holidays. You can get your pre-orders in right here, and I highly suggest that you do as soon as possible because, like the previous versions, they won't last long. The official descriptions for each product are available below. More Nick: BOOM! Studios Announces 'Rugrats: C Is For Chanukah' One-Shot Holiday Special! 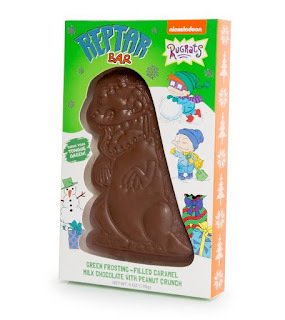 Nickelodeon and FYE have teamed up to bring you a Deluxe molded Reptar Bar, just like in Rugrats! Hold on to your diapies babies! We're bringing 90's nostalgia back in full force! This Reptar Deluxe bar lives up to the greatest jingle known to every 90's kid! "A Reptar Bar is chocolate and nuts and caramel and green stuff and-and-and it’s swirled and stirred and rippled and beaten and sweetened until you can’t stop eatin’. The superist! The duperist! The double chocolate scooperist! The meanest. The best! It’s better than the rest! Reptar Bar! Reptar Bar! The candy bar supreme! The candy bar that turns your tongue green!" This deluxe piece is a green frosting filled caramel milk chocolate with peanut crunch shaped into the hottest dinosaur around, REPTAR!!!! - Turns your tongue green! - Winter style packaging featuring Chuckie Finster & Tommy Pickles playing in the snow! - Christmas style packaging featuring a Christmas tree & presents! 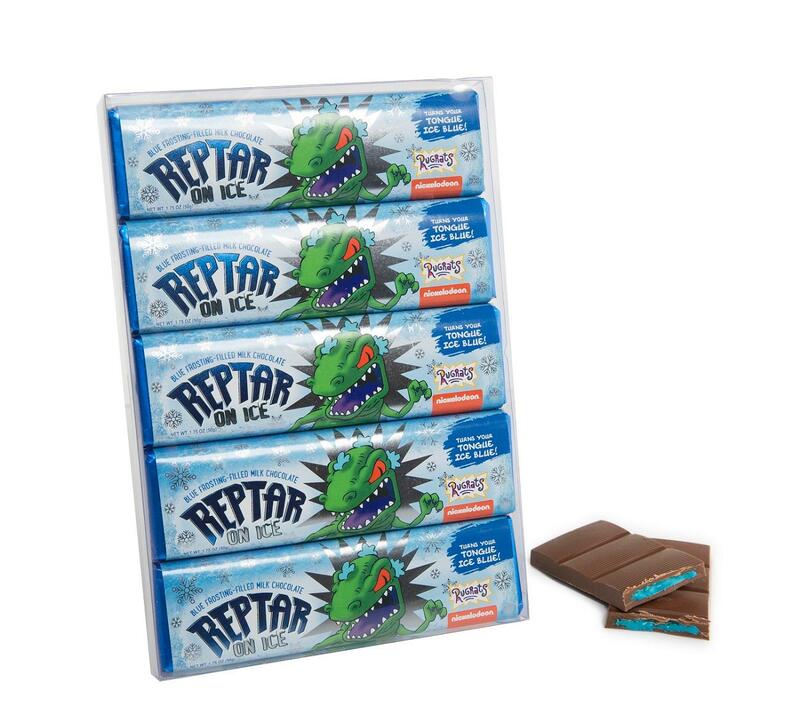 Nickelodeon and FYE have teamed up once again to bring to you a new holiday version of our famous Rugrats, Reptar bar... "Reptar On Ice"
This is an exclusive 5 pack that can only be found here on fye.com. Each pack contains 5 individually wrapped chocolate bars with a blue frosting inside to turn your tongue "ice blue". Be prepared to Tear Open... Chomp...and Roar Like Reptar! Watch all your '90s Nickelodeon favorites on NickSplat, your late-night destination for your favorite childhood Nickelodeon cartoons and live-action shows! NickSplat doesn't question football-shaped heads, but embrace them - along with Reptar bars, a Big Ear of Corn, orange soda, and even slime for Pete (and Pete's) sake. Make your slime-covered Nickelodeon childhood dreams come true every night at 11 PM ET/PT on TeenNick USA, and anytime you want on NickSplat on VRV! #NickSplat! More Nick: Nickelodeon and Paramount to Bring 'Rugrats' Back for the Next Generation of Kids with an All-New TV Series and Feature Film! Sources: ComicBook, /Film; Additional source: Bustle. Follow NickALive! on Twitter, Tumblr, Google+, via RSS, on Instagram, and/or Facebook for the latest Holidays on Nickelodeon and Rugrats News and Highlights!